Dynamic strength is another way of saying explosive strength or POWER. And you might be forgiven to think that power is just power, but in my world it is not. Different events in athletics or different sports demand that peak power is developed over different time-frames. The speed at which force is produced is commonly called the “rate of force development”. Don’t get me wrong, you can become powerful – very powerful – by just pushing weights. In fact, it’s impossible for you not to become more powerful by just getting stronger. However, this type of power only relates to the wattages, the end number that the athlete produces. It doesn’t tell where or when peak force was developed along the force-time curve. By calling it dynamic strength we are trying to describe and demonstrate the rhythm and the time-frame of how this particular type of power or force was generated. Dynamic strength therefore, is the type of power which is expressed in a jumping or explosive activity such as plyometrics and relates to sports where running, jumping and quick changes of directions are involved. If you only train for strength and power in the weight room, you will usually only develop power that is one dimensional. Unless you are a weight lifter, there will be little carry-over to your event or sport. However, by adding plyometrics exercises to your training routine, you can bridge the gap between the strength gained in the weights room and the expression of power that is required in the sports arena. Plyometrics exercises are the ONLY training activities that can achieve this. Due to the explosive nature of plyometrics exercises they can be harmful to athletes if executed incorrectly. By paying attention to some basic technical advice, you will be able to take advantage of this great way of getting a performance advantage over your competitor. Below are examples that explain and demonstrates how to perform two of the most common plyometrics exercises. The hop is performed by taking off on one leg and then landing on the same leg. You should try to perform the hop in a bouncing dynamic manner. Weaker or novice athletes should minimize the amount of flexion around the hip and knee during the flight phase of the hop until it is learnt properly or their strength levels increase. Steps or bounds as they are called in some circles are giant leaps. 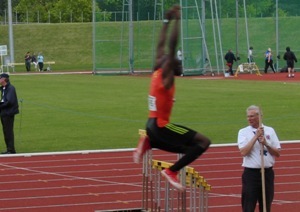 The athlete drives from the ground on one leg and lands on the other leg. The shin or lower leg of the front thigh is positioned below or behind the knee. You should try to perform the step in a bouncing dynamic manner. Initially, you should practice these plyometrics exercises with only 3 or 4 contacts in any single attempt. This will allow you to perfect the techniques of the take off and landing before building them into a full training routine. You will also need to be careful about total volumes and loads. From "Explode Into Plyometrics Exercises" Back To "Faster, Stronger, Better – Your Shortcut To Improved Athletic Performance"